It might seem like devolution instead of evolution, but NASA is working on a less sophisticated robot for lunar mining operations. Instead of a research scientist space rover that collects tons of data and sends it back to Earth or analyzes it right there, the new robot will essentially be a grunt tasked with heavy labor. The prototype Regolith Advanced Surface Systems Operations Robot (RASSOR) will spend months or even years digging away at the lunar regolith — the mix of loose soil, dust, and rock covering the layer of solid bedrock on the moon, other planets, and some asteroids. It contains valuable materials such as oxygen, hydrogen, silica, as well as metals like titanium, aluminum, and iron. These could be used to make rocket propellant, water, air, or construction materials for astronauts, saving the extremely high expense of shipping all the supplies from Earth.To extract these materials by machine takes many hours of hard work in the harsh environment of space. 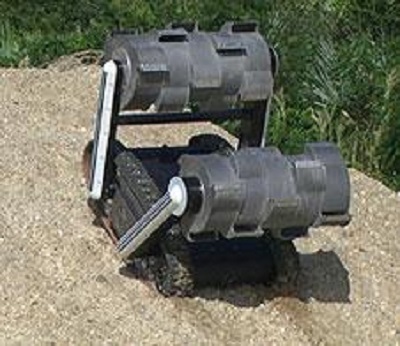 For that kind of consistent work, a robot miner must be rugged, efficient, and highly reliable. In addition, it must be powerful enough for excavation and hauling, have enough mass not to fly off in a low-gravity environment, and be small and light enough for a rocket to carry it with minimal use of fuel, according to NASA. RASSOR is being built by a team of engineers at the Kennedy Space Center to fulfill these requirements. Its basic design looks a lot like other robots used for military, space, rescue, or scientific exploration applications: small and tank-like. Much of the design challenge lies in the fact that, unlike Earth-based automated mining machines, extraterrestrial robots working in reduced-gravity environments can’t use their weight to produce the force needed for digging into soil and rock. Team members solved that problem by giving RASSOR one arm on each end. Each arm is attached to a drum-shaped digging bucket. The arms rotate in opposite directions, while both bucket drums excavate at the same time. 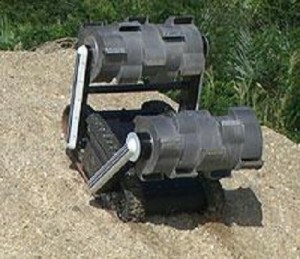 The drums can be repositioned to act as legs for navigating obstacles.The current version of the robot is about 2.5ft high with its drums extended above its body. The final version will weigh about 100lb. 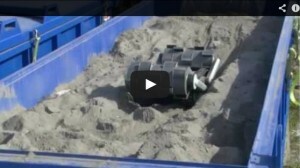 RASSOR’s operation has been tested on several surfaces, including crushed river rock and imitation lunar regolith.To get usable amounts of the necessary substances from the regolith, large quantities are needed. The team estimates that RASSOR would need to work for five years at 16 hours per day to mine enough lunar soil for delivery to a plant. After excavating, RASSOR would deposit the soil into a device that extracts water and ice and converts the remaining chemicals into oxygen or fuel for astronauts. That device will be part of the lander that delivers the robot to the moon. The design team expects to begin testing version 2 of the prototype next year.